Villas fully renovated in mid 2017, Bayview Geographe Resort is located on the beautiful beachfront with its own access to the beach. 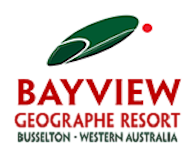 Surrounded by whispering peppermint trees and fringed by the white sand shores of Geographe Bay, Bayview Geographe Resort combines secluded private villas with sociable, family-friendly facilities. Whether you’re planning a romantic honeymoon in Western Australia or travelling with friends, there are 1,000 ways to spend your days at our Busselton beach resort. Take a peaceful stroll through beautifully tended gardens or enjoy some sporting action on our tennis, basketball and beach volleyball courts. It’s a few steps to the beach, where you can swim, snorkel, sunbathe or simply enjoy the endless Indian Ocean views. Children are welcome at our heated indoor pool, while kids’ club activities keep your little ones entertained during school holidays.